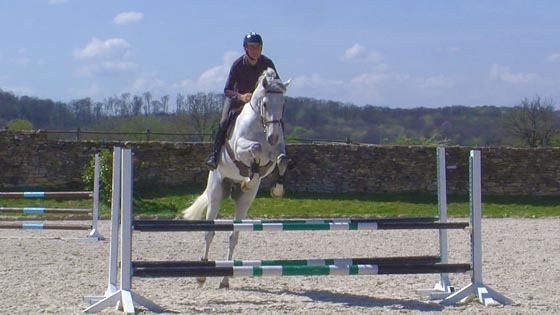 Performing a flying change of lead presumes that the rider has a clear concept of the movement and the horse has a good understanding of what the rider is asking him to do. Michel offers a very gradual exercise with an easy set-up and a precise track. 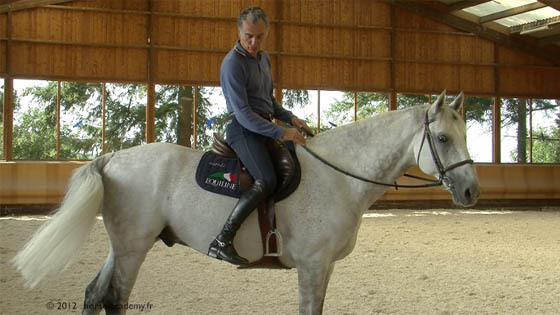 By following closely the steps of this exercise, young horses or less experimented riders will clearly understand to break down the movement and achieve the position needed to perform a flying change of lead. As always, to execute successfully this exercise, the rider needs to anticipate and prepare each movement and action: hence the importance of taking time to understand it and to make the proper adjustments. To demonstrate this exercise, Michel teaches Marine who rides Vivaldi, a 9 YO stallion owned by the Haras de Hus. This well trained horse is already accustomed to the exercise. Therefore, Marine will be able to execute the 3 steps of this exercise in the same session. It is obvious that a young horse or a less experimented rider should work on each step over one or several sessions until the results allow you to get onto the next step. In those cases, Michel advice and recommendations will be particularly useful since they emphasize in the rider’s position and the mental attitude to adopt in order to learn and succeed flying change of lead.